3rd December 2018. Peacefully At Her Home 19 Fortfield Avenue, Surrounded By Her Loving Family. Beloved Wife Of Paddy, Loving Mother To Deirdre, Gerard And Fergal And A Devoted Grandmother And Great-Grandmother. Funeral Leaving Her Home On Wednesday the 5th. Inst. At 10:20A.M. To St. Brigid's Church, Carnhill, for Requiem Mass at 11:00a.m. Interment afterwards in The City Cemetery. 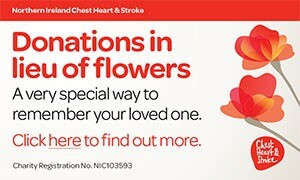 Family Flowers only, donations if wished to Foyle Hospice, 61 Culmore Road, or Marie Curie, c/o. 6 Mount Pleasant, Culmore Road. Sacred Heart Of Jesus Have Mercy On Her Soul. Our Lady Of Lourdes Ircede For Her. I am sorry to tell you that Maureen BRESLIN has passed away.